Words can protect, promise, or punish; affirm, advise, or accuse. A few choice words can inspire a child to become a great preacher or writer—or discourage a budding talent. Words can restore relationships, heal frayed emotions, and even work miracles. 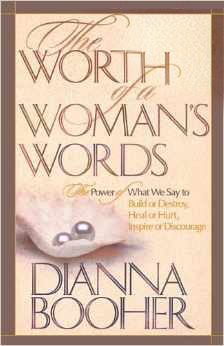 In The Worth of a Woman’s Words, Dianna Booher shows how words can be heard long after they are spoken. An offhand comment from an elderly woman can reveal to her granddaughter the secret to finding a good husband—or crush the young woman’s spirit and damage their relationship. The power of one person’s words can cause a man to learn to walk—or cause a young singer to vow never to sing another note. With heartwarming stories, thought-provoking quotes and Scripture, the author offers 41 ways our words can build, heal, and encourage—and 29 ways our words can discourage or destroy. This book will challenge you to think about the ways your words affect others, and encourage you to use them wisely, deliberately, and well.